The ZAD is a long-term occupation in France of people struggling against the construction of an airport. For years, people living on the ZAD have been battling the police who try to evict them from the land and crush their demonstrations. On October 26th, the police killed a protester, Rémi Fraisse, by shooting him in the head with a teargas canister. In response, the ZAD is calling for an international day against the police on November 22nd. Also see the ZAD’s statement of solidarity with those fighting against the police in Ferguson. The repression that falls on those who oppose the mafia-like projects of politicians is ever more violent. The Socialist party coming to power hasn’t changed anything. The police, the gendarmes and the army injure and mutilate as much as ever, maybe even more, surfing on the wave of fascism that is rising up under the guise of a world economic crisis, and thanks to their weapons, becoming always more efficient with the emphasis on military technology. Even more worrisome than constantly increasing war budgets is the unwillingness of cops, gendarmes, soldiers and their politician bosses to take responsibility for their violence. The omnipresence and unrestrained usage of flashballs, defensive ball launchers, and explosive grenades are some concrete examples. The discourse is also simplified, glossed over, and the violence made to seem mundane. When we ask the cops in front of us if they are proud to have killed, they smile or threaten us. One of the police authorities in the Tarn recently affirmed that those who oppose the “forces of order” should expect violence and eventual injury. And, some days ago, the police killed. Again. We, who were gathered together in Testet to fight against this deathly project of the Sivens dam, we lost a friend. In the early hours of Sunday, October 26th, a few meters from soldiers of the State, armed and protected by their weapons and shields, Rémi Fraisse was murdered by the armed branch of the State. By the level shot of a mercenary’s grenade, most likely aimed at his head, the explosive hit between the base of his neck and his shoulder. This despite that even the internal laws of the armed branches of the State forbid level shots at a certain distance and also forbid aiming at the head, or with some weapons, aiming at all. This was not an accident. It’s even surprising that such a drama hasn’t happened earlier. The attacking police, gendarmes, and soldiers brake their own laws every day (of the evictions). We’ve lost track of the knees, hands, stomachs and heads that have been targeted. Their extraordinary and illegal violence leaves its trace on all of us, whether physical or emotional. This time it took someone with it: Rémi Fraisse. But even if Rémi’s murder is headlining the nightly news and embarrassing the government, don’t believe that it’s an exception. We’ve stopped counting on the charges pressed by those close to the ones murdered by an armed branch of the State. None of these trials have resulted in prison sentences. We want rapid and implacable justice for the murderers in the armed branches of the State. We demand that starting now, there is a legal amnesty for all those arrested for their opposition to the Sivens dam, who we consider to be almost political prisoners. We also demand the total disarmament of the multiple armed branches of the State, to end the murders, the “mistakes” and the violence of police, gendarmes, and military. Thus we join the call of the ZAD of Notre Dame des Landes to demonstrate everywhere against police repression on Saturday, November 22nd, 2014. We call upon every person and every group that feels concerned by the danger represented by the State’s police forces to make actions and protest from wherever they are. Let’s make November 22nd a national and international day against the violence of armed branches of the State, but let’s not forget that every day, before and after the 22nd, is a good day to make an insurgency against the existence of an institution which mutilates and murders for a “law-based” state and their profitable, mafia-like, and devastating projects. Where did it come from, the grenade that killed Rémi? Strategic proposal for what comes next. Rémi was killed by a police concussion grenade, Sunday October 26th. What happened to him could have happened to any one of us, anywhere. Some days later, Thursday the 30th, in a northern neighborhood in Blois, a young man lost an eye to a state rubber bullet. Saturday in Nantes, a demonstator took a rubber bullet to the face and lost his nose. How many times must history repeat itself? We are not making demands to State power, for the conviction of the cop who shot him, or the resignation of a higher police official, or even the Minister of the Interior. For the death of Rémi to resonate everywhere and provoke a real movement, we propose to organize ourselves locally and nationally against the infrastructures that maintain order. These are the infrastructures which make possible the terrorism of the State, which we are confronted with in the “ghettos” as well as in our social movements. These are the infrastructures which organize the police occupation of our territories and our existences. It is also them who are deployed as soon as a movement of opposition or contestation adventures outside of traditional paths cordoned off by powerlessness. France is an expert in maintaining order, by neutralizing all efforts of people to rise up/bring themselves up. It exports globally it’s knowledge, weapons, and forms to many foreign police forces. It has also participated in crushing movements across the world, as in the insurrections of the Arab Spring in 2011. Didn’t Michèle Alliot-Marie brag to have provided French expertise in counter-insurrection to the Ben Ali regime? Paralyzing the infrastructure of the police is an act which, outside of the national context, supports all those who organize to struggle in other places and have to dodge French bullets. The factories that make grenades, uniforms, and equipment for the police, their vehicles and their televised propaganda, the logistical platforms that organize food supplies for the troops; for us they are all targets. Outside of occasional confrontations or deployments, the continued existence of the armed group known as the national police depends on these resources. The announcement that a certain type of offensive grenade has been suspended will not bring about a “return to calm”. What’s at stake in this movement, born on October 25th, is disarming the police. Flashballs, tasers, concussion grenades, have sufficiently mutilated, injured, or killed in these past couple of years. We are no longer in the era of Malik Oussekine or Vittal Michalon*. 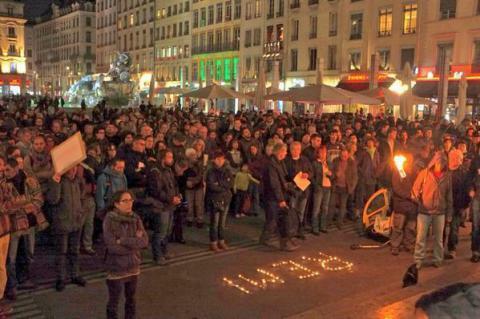 Not a single union, not a single leftist organization called out for people to take the streets after Rémi’s death. They are in fact so afraid of the streets, they are reduced to organizing virtual protests like those proposed by the Green Party (#occupysivens). What can we expect from the “Occupiers” who “condemn the violence of both sides” by carefully omitting which camp is equipped for war and which has a few cobblestones? That one side kills people and the other expresses their rage by breaking windows? At a time when the left is decomposing, when the far right are on the upswing, why is there not a single reaction from leftist political parties, NGO’s, or unions, after this police murder? This week, 90 protests were organized in around 60 cities. We address our call-out to this autonomous power in the making. The collective emotion expressed in rage and contemplation is legitimate, but won’t be enough to change the situation. We call for a long term strategy, consisting of harassing and collecting information on all those who support repression, to disrupt all the technical ways which permit it to be armed, to move, to feed itself, and more. These objectives encompass a diversity of tactics that correspond to the resources and limitations of groups and individuals. Noise demos outside police stations and barracks, verbal harassment of patrols, suing the police for injuries, sabotage, street demos; it’s the simultaneous usage of all these tactics that will help us to establish a favorable “rapport de force” against the police, in our neighborhoods and in our struggles. A call-out is coming soon to organize demos in front of police weapons manufacturers. A list of strategic places will also appear soon. This is a strategic proposition that we are addressing to all those that are assembling, agitating, and organizing so that the backlash against this latest police murder spreads and grows.